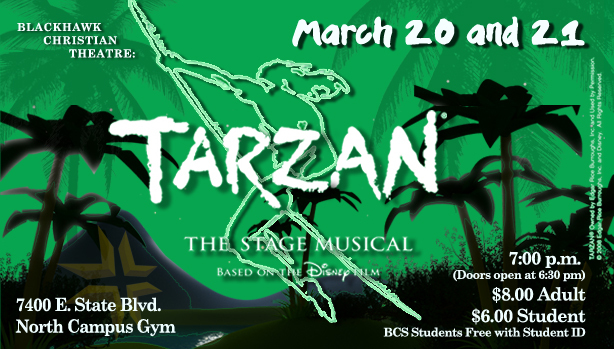 For this year’s musical, Blackhawk Theater is presenting Tarzan. Performances will March 19th-21st, beginning with the matinee for students and staff on the 19th. Performances for the public with be at 7 pm on the 20th and 21st. Madison plays the role of Kala, Tarzan’s ape mother who takes care of him after his parents die. What is the hardest part when trying to portray this character? Definitely walking like an ape…it’s a lot easier said than done, that’s for sure! What’s you’re favorite song in this musical? That’s a really tough question…All of the songs are so fun, I love them all. But if I had to pick, I would have to say “You’ll Be In My Heart Reprise”. This is a song that I get to sing with Tarzan, and it makes me tear up almost every time we sing it! Are you personally ready? Nervous? Excited? Uh… I’ve actually been super emotional throughout this whole production! I got the part I wanted, so I’m super stoked about that! But then I’m a senior, so this is my very last performance here at Blackhawk and I’m just not ready for that. I love performing with my theater family, I’m going to miss being on stage with them and practicing with them 24/7. I’m also going to miss working with Mr. L and Mr. McKown. I love them to death and they have played a huge part in my theater career. Part of me is super excited to perform because it is going to be awesome! But then I’m also not ready because it goes by so fast, and once it’s over, it’s over. What’s your favorite part of performing? COSTUMES! I love costumes and makeup! It’s so much fun to wear things you would never wear any other day. Especially in this musical because I’m an ape, so my costume and my makeup looks pretty cool. Fridays… Fridays seem to be the days where everything goes wrong during the performances, and we can’t do anything but continue doing what we’re doing. I also don’t like STRIKE. This is where we tear down the set and pack everything away. It’s kind of sad because we work hard for a long time to perform for only 3 days, and then we’re done. It’s especially sad for the seniors because it reminds you that you’re done performing. So you obviously love The Arts. Do you plan on doing anything like this later in your life? I’m actually going to college for Musical Theater, Playwriting, and Special Effects Makeup. My hope is to be on Broadway, and hopefully along the way I can direct a few plays and musicals. Posted in Fine Arts, Parent Information, TheatreTagged Madison Arrington, TarzanBookmark the permalink.